Conjuring roses, cherry blossoms, and all things spring, this dusty rose linen will set the mood for any event. Mauve Swell evokes a secret garden’s atmosphere when the roses first bloom, giving your guests a fresh and romantic experience. 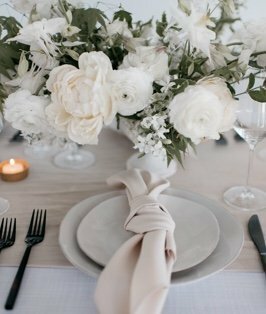 The Swell fabric creates the perfect foundation for any garden-inspired or romantic tablescape.